*Note: Yoga should always be taught by a qualified and experienced yoga instructor. The intention of this article is to provide insight into the Voice Colors methodology for making yoga a successful and effective experience for our participants. Billy is a 25 year-old man with an athletic build, good muscle tone and and a healthy spine. Like many adults in our chair-sitting culture, he has less than ideal posture. Billy presents with a combination of externally rotated feet, anterior pelvic tilt, protracted shoulders and forward head; a postural profile common in men and exacerbated by Billy’s tendency to hold muscle tension in his hips, neck and shoulders. Billy has GERD and esophagitis, causing him intermittent pain and discomfort: It is well documented that improving posture can help to minimize GERD symptoms. It is also likely that Billy has developed a defensive posture in response to physical discomfort, adding to the tension he holds in his upper body. Billy also presents with non-verbal autism and learns best with structure and visual supports. In the Voice Colors program, Billy benefits from a holistic approach to his learning and development: The importance of strengthening his communication and independent living skills is not overshadowed by the need to maintain his physical and emotional health. Everyone functions better when they feel well and for Billy, like many individuals on the autism spectrum, illness or physical discomfort can present a major obstacle to successfully meeting the demands of each day. 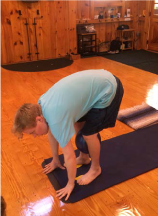 A major goal of Billy’s yoga and fitness curriculum is to develop healthy posture now in order to help minimize Billy’s discomfort from GERD and to prevent lower back problems or other structural issues from arising later in Billy’s life. 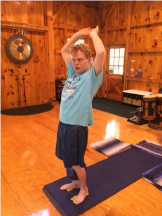 Over the next several weeks, Voice Colors will present a series of articles to describe our methodology to teach and and reinforce healthy posture for Billy. Yoga poses are taught from the ground up. 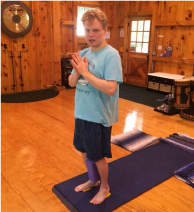 For example, a student should stand with both feet parallel in mountain pose before lifting one foot to balance in tree pose, otherwise the entire pose will be misaligned on top of an externally or internally rotated foot. The first step in addressing his posture was to place foot markers in proper parallel alignment and to practice this standing position. *Note: Billy’s hips allow for his feet to be in parallel alignment without strain on his joints. Some students with very tight or misaligned hips or knees may not be comfortable with straight feet. Never force a student into an uncomfortable pose! 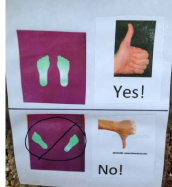 We also created a poster and displayed it front and center in the yoga space as a visual reminder, and consistently directed Billy to reference the poster with a gestural prompt (pointing) whenever he needed to straighten his feet. Note: Non-verbal cues such as gestures are preferable to verbal prompts when possible, as they are easier to fade. We had Billy practice “straight feet” by holding a block and a Fitball while standing to engage his hip adductors (the inner thigh muscles that help to rotate the thighs internally and bring the legs together). The props also provide tactile feedback in order to bring Billy’s attention to his legs. We had Billy perform reaching and bending movements while holding the props and keeping his feet straight. 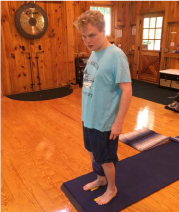 Generalizing “straight feet”: We used physical assists along with visual supports to help Billy to align his feet and engage his hip adductors in other positions such as plank pose and downward dog pose. 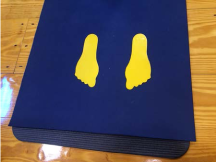 We will continue to build the concept of “straight feet” into Billy’s yoga and fitness routines. Changing posture requires patience and practice: The body needs time to adapt and the concepts need to become internalized. Stay tuned for part two where we will introduce the next stage in building posture from the ground up: “Strong Belly”.